Music is an essential part of the human experience. Earphones allow us to control the music in our environment at all times. But they can also be cumbersome. All the wires impede your movement. The cord constantly gets caught on things, yanking the buds from your ears. And your phone has to be so close it’s a burden. Luckily, today we have Bluetooth. Bluetooth is a wireless signal built into most portable devices today. It allows us to send our music through a frequency to our earphones, freeing us from restricting wires. 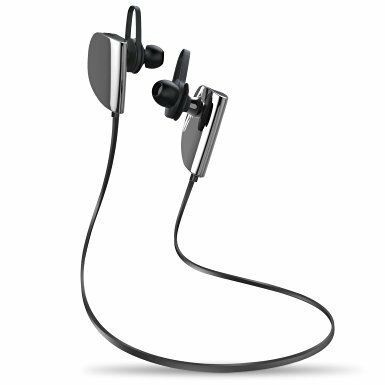 Wireless earphones have become widespread and more affordable in recent years. The Vomach Bluetooth Earphones are some of Amazon’s most popular sets. There are so many wireless earphones on the market, it can be difficult to choose a good pair. But there are a few features that separate the greats from the subpar. Sound quality is one of the most important factors to consider. Earbuds are so small. It’s possible to cram the equipment necessary for great audio into such a small package. But it can become really expensive to get both the small size and the great quality. Usually, you’ll have to compromise a bit of sound quality for a great price. Or if you want your music to sound like you’re in the club, you may have to dish out a little more dough. The other really important feature is the Bluetooth signal. All Bluetooths are not created equal. Bluetooth signals reach a span of about thirty feet. But not all earbuds can really maintain that distance. Many lower end earphones will cut out in less space than that. The signal can also be severely impaired by obstacles. But if you can’t keep your phone in your back pocket, is the wireless really worth it? Getting a strong Bluetooth signal is essential to great earphones. Battery life is important, too. With the Bluetooth, wireless earbuds need to run on their own batteries. They should last long enough for you to do all you need to do between charges. A comfortable fit is important, as well. If you’re going to be listening for hours, you don’t want your ears to start aching. Additionally, there are a few little features that are sometimes included in wireless earbuds. These can set a pair of earbuds above the rest. Some earphones let you pair your Bluetooth to two devices at once. This can be great if you have two phones. You can listen to the music on your personal phones while not missing calls on your business phone. A microphone allows you to take calls wirelessly. Noise cancellation on the microphone allows your calls to be extra clear. Many earphones also have the ability to control your music straight from the headphones. You can play, pause, skip, and adjust the volume straight on the earbuds. No more reaching for your phone! The Vomach Bluetooth Headphones have a simple, sleek look. The buds themselves have a shiny silver finish. The accents are black. They are small, which is a benefit. Earbuds that are too large will fall out of your ears. This can be more trouble than it’s worth. Little ear stabilizers also secure the earbuds in your ears. The battery life on the Vomach is substantial. It lasts for about five hours of continuous playtime. You get a bit more time if you’re making calls. They can last about six hours of talking time. They take about an hour and a half to charge. A built-in microphone is great for making calls. The earbuds have noise cancellation. This greatly improves the transmission of your voice, reducing background noise. The Vomachs can pair with two different Bluetooth signals simultaneously. They pair easily and switch between the two seamlessly. No work is required on your part. Take a call on one phone and your music will be paused. When the call is ended, your earbuds will automatically switch back to playing your music. The Bluetooth signal can also control the music on your phone. Most phones will be able to be controlled by buttons on the earbuds. There is a call button and volume control. There are no buttons for skipping or pausing. Overall, the Vomachs do a pretty good job. They are comfortable to wear. There is a natural curve to the earbuds, so they fit nicely into the ear. The stabilizers are very effective. The buds rarely fall out, and never for no reason. The sound quality is decent. You can hear everything well with clarity. The area in which the Vomach earbuds are lacking is in the Bluetooth. The Bluetooth connects to two devices and switches between them very well. But sometimes the connection is not incredibly strong. It gets wobbly before the standard thirty feet. It’s also affected by obstacles like walls and bodies. It will do the job, but you need to make sure to have your phone near you when listening to music. The battery life is pretty standard for most comparable models. The noise cancellation on the microphone gives it some definite bonus points. The controls on the earbuds are great, but it would be nice if they had more functionality, like skip and pause. The Vomach Bluetooth Earbuds are awesome earbuds for the price. They do their job well, and free up your hands for doing whatever it is you do. It would be hard to find another pair of the same quality in the same price range. Be sure to check out our reviews of the other bluetooth earbuds while you are here with us.